Hank Azaria attended Tufts University in Medford, Massachusetts, from 1981-1985, but did not receive his B.A. until he completed two courses in L.A. in 1987. 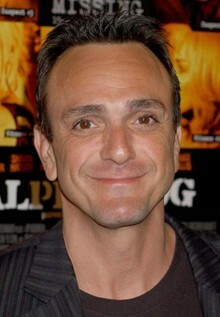 Hank Azaria was given Tufts’ Light on the Hill Award in 1999. Azaria, who trained at the American Academy of Dramatic Arts in New York, is a master of film, stage, and screen. He’s appeared in numerous TV shows, including Herman’s Head, Friends, and Mad About You as well as movies like America’s Sweethearts and Mystery, Alaska. He was also a bartender in New York at the Arcadia, which may have helped him prepare for his most notable role as Moe Szyslak, on Fox’s The Simpsons. He voices many members of the cast, including Police Chief Wiggum, Apu, Cletus, Professor Frink, and Comic Book Guy. While he’s stil working on the Simpsons, Azaria has a new series he’s working on, Huff, in which he plays a psychiatrist who’s wide array of patients keeps him quite frustrated, along with his family. Do you want to hire Hank Azaria? Directly request a quote. In 48 hours we can send you the availability of Hank Azaria If you would like to book Hank Azaria, Entertainment Booking Agency is the right place. We will offer you the best price and contact the management or we directly contact Hank Azaria. For corporate appearances or speaking engagements you can contact our agents and the will help you true the process. Tags: hire Hank Azaria, Hank Azaria booking, book Hank Azaria, Hank Azaria appearances, find more information on booking Hank Azaria for appearances, Hank Azaria speaking engagements, Hank Azaria endorsements/spokesperson, Hank Azaria appearance fees, Hank Azaria booking agency contact info, biography of Hank Azaria, Contact an artist booking talent agent find a speakers bureau that can book Hank Azaria, speaker booking agency for Hank Azaria, Hank Azaria booking agency, Hank Azaria booking for corporate event. EBA is one of the biggest entertainment booking agencies in the World. We book hundreds of celebrities, artist, athletes and speakers in a year. Important to know is that we are not claiming to be the management of Hank Azaria. We are not the official agent for Hank Azaria. Companies from around the globe book these artists and speakers true our company be course we have one of the biggest networks and we always have direct contact with the artist or the management. We help you to find the right celebrities for your corporate of private events. Please contact one of our agents to get free advice and we will help to get the world-famous artist on your party.